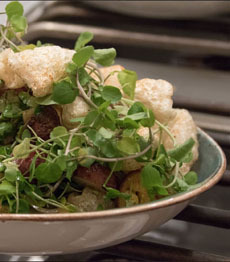 Top: Don’t these homemade pork rinds look so much better than store-bought? Photo and recipe courtesy PaleoLeap.com. Center: Pork rinds are also a delicious garnish for soups and salads. Photo courtesy Culinary Vegetable Institute. Bottom: Pork cracklings are made from the skin and fat; pork rinds are the skin (rind) only. Photo courtesy Padaek.com. Check out the recipe. 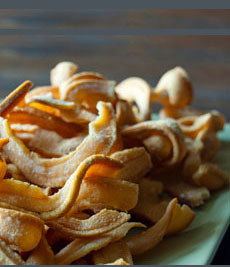 As we think ahead to Father’s Day, we’re mulling over some homemade versions of popular snack foods from potato chips to pork rinds. Pork Rind Appreciation Day, established by Rudolph Foods (which sells pork rinds), is held on Super Bowl Sunday. But we like the idea of homemade pork rinds and a cold beer on Father’s Day. Pork rinds (chicharrónes) are made from pork skin, with the attached fat removed. That’s the difference between pork rinds and pork cracklings. Cracklings (called grattons in Cajun cuisine) include the fat that adheres to the skin. 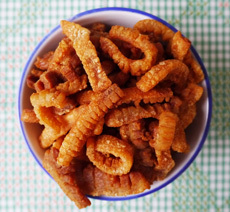 Because of the extra fat, cracklings are greasier, denser and a bit chewy. Pork rinds are airy like cheese puffs, and they dissolve in your mouth. Here’s an idea: Buy pork belly to make grilled pork belly or pork belly skewers, and turn the skin into pork rinds. You can also buy the skin only from butchers (it’s quite inexpensive). Be sure to use skin within three days of purchase, as its high moisture content means it can spoil quickly. The finished pork rinds will keep for a long time if cooked long enough for all the fat to be rendered out. Here’s a recipe for homemade pork rinds from Paleo Leap, which serves it as a crispy Paleo Diet snack with dilled mayonnaise or tartar sauce. Some pork rinds are deep-fried. Others, like this recipe, are roasted (the difference between roasting and baking). With homemade pork rinds, you control the salt. You don’t need to use any salt at all; the pork rinds will still be delicious. You can supply a salt shaker for those who must have it. Or, you can choose another seasoning. Garlic? Pepper? Curry? 1. PREHEAT the oven to 325°F. Line a baking sheet or roasting pan with parchment paper to make clean-up easier. 3. REMOVE from the oven and cool until they’re warm to the touch; enjoy them warm. Scrunchions, popular in Newfoundland, are pieces of fried fat (no skin).